Learn how to customize a built-in integration and how to set up a custom integration. Integrations are one easy way to get data from external systems into Wavefront. Use one of the built-in integrations and customize it as needed. We update our list of new and updated built-in integrations monthly. Sign up for a Wavefront trial to try integrations. Detailed setup steps for each integration are in the product. The Overview tab explains how the integration works and what’s included, often a sample dashboard with commonly used charts. The Setup tab has instructions for configuring the integration. 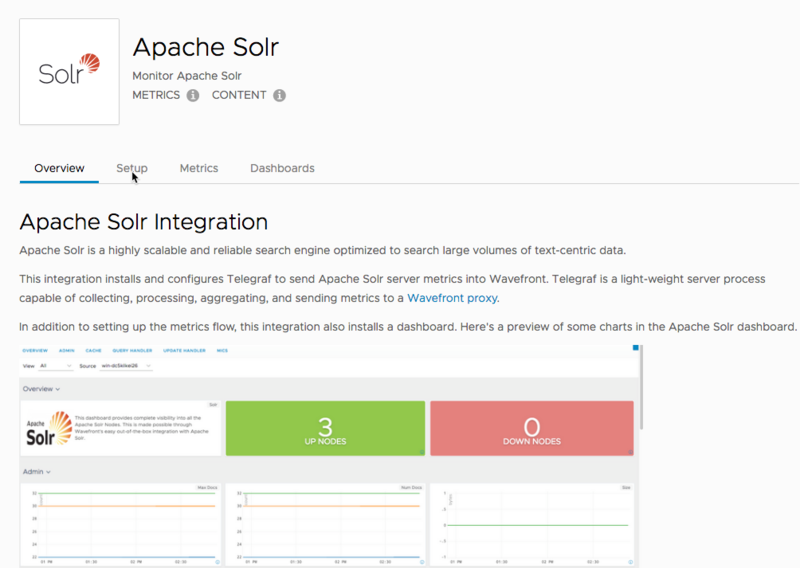 Here’s a screen shot that shows the different tabs of the Apache Solr integration. Note Even if we don’t have an integration for you data source, you can send your data directly to the Wavefront proxy in one of the supported data formats. Wavefront lets you set up many integrations directly from the product. For other integrations, we give step-by-step instructions – or you can send your data to Wavefront in other ways, for example, using the Telegraf output plugin for Wavefront. Built-in integrations provide assisted installation and configuration. Many integrations also install a dashboard for you. Access the integration by selecting Integrations from the task bar and clicking the Setup tab. Customizable built-in integrations provide a built-in integration for the initial connection, with additional customization information in this documentation. Custom integrations provide installation and configuration instructions in this documentation. Whether metrics ever reported and whether they reported in the last 2 hours or in the last 7 days. The state of content installation: never installed, installed, uninstalled. Active - integrations whose metrics are reporting and installed or uninstalled content. Available - integrations whose metrics never reported and never installed content or integrations that don’t have metrics. Warning - integrations whose metrics never reported and installed content. Error - integrations whose metrics reported within the last 7 days but have stop reporting for 2 hours and installed content. Installed Integrations - integrations in the Active, Warning, or Error state. An integration can be in one of these states even if content has been uninstalled. For example, the following integration is in the Error state because metrics have reported within the last 7 days but have stopped reporting in the past 2 hours and content is installed. You can install and uninstall dashboards from Featured and Data Collector integrations. While every Wavefront user can view integrations, you must have Integration Management permission to install and uninstall integration dashboards. If you do not have permission, buttons to perform these tasks are not visible. Click [Install | Uninstall] Dashboards. You cannot modify Wavefront system dashboards. Instead, click the Edit (pen) icon, select Clone, and provide a URL string that’s just the name (e.g. mydashboard) and not the URL (e.g. http://mydashboard). You can then customize the clone to suit your needs.